Shag and Rob start the episode with a brief discussion on an upcoming Firestorm action figure! Next, a healthy dose of your Listener Feedback! This episode Rob and Shag dive into AQUAMAN #28 by Jeff Parker, Paul Pelletier, Sean Parsons, and Andrew Hennessy. Plus the guys face the return of Typhoon in THE FURY OF FIRESTORM #8 (Jan. 1983) by Gerry Conway, guest penciller Jerome Moore, Rodin Rodriguez, and Gene D’Angelo. This episode Rob and Shag dive into AQUAMAN #27 by Jeff Parker, Paul Pelletier, Sean Parsons, Netho Diaz, Ruy Jose, and Rod Reis. Next the guys face Plastique in THE FURY OF FIRESTORM #7 (Dec. 1982) by Gerry Conway, Pat Broderick, Rodin Rodriguez, and Gene D’Angelo. They also spend a few moments discussing FOREVER EVIL: A.R.G.U.S. and your feedback! Geek out with us! This episode Shag and Rob discuss a range of comic-related topics, such as: Dan Jurgens on AQUAMAN and THE OTHERS and THE NEW 52: FUTURES END, the new Justice League animated movie, JUSTICE LEAGUE UNITED, ways to make DC money from old school fans, and the first installment of the long-awaited TALES FROM THE KUBERT SCHOOL! This episode Rob and Shag dive into Jeff Parker’s first issue swimming with the King of the Seven Seas! AQUAMAN #26 by Jeff Parker, Paul Pelletier, Sean Parsons, Netho Diaz, Ruy Jose, Wil Quintana, and Andrew Dalhouse. Next the guys follow the Pied Piper into THE FURY OF FIRESTORM #6 (Nov. 1982) by Gerry Conway, Pat Broderick, Rodin Rodriguez, and Gene D’Angelo. Because you demanded it! 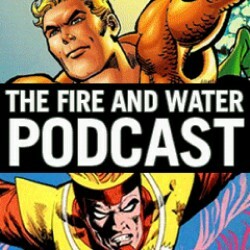 We end 2013 with the first Fire and Water Podcast Soundtrack Album, featuring the various themes and songs from our previous episodes! Featuring songs by Daniel Cynical Adams, Roy Cleary and Jason Jones, Luke Daab, John Godwin and Rachel, Robert Gross, and The Bad Mamma Jammas!